It is highly dependent on patient self-care actions that include daily self-monitoring of blood glucose, medication and dosing adjustments, diet measurement, carb management, physical activity, and logistic management of all the stuff needed to do all of the above. Diabetes has a well-documented comorbidity of clinical depression and a subclinical level emotional exhaustion from the burden of management. Diabetes is complex. Whoever manages it, needs tools they can work with. My dear friend Manny Hernandez has a spectacular visual representation of the time patients self-manage. A chart that shows the percentage of time people with diabetes self-manage vs the time we spend with our physicians, diabetes educators, and care teams. It is below. See that little white line? That is time with the care team. BUT to make the little white sliver visible, Manny had to exaggerate its proportion of the graph. This is not to minimize the role of our professional care teams but to make it visible. Manny is not alone in making the point of the importance of patient self-care. Here is Manny’s chart, presented by renown endocrinologist Dr. David Marrero at the ADA Scientific Session in 2015. In the image, we see one diabetes doctor talking with a huge room full of other diabetes doctors making the point that respecting the role of patients is critical to success. Let just pause and think about what this image represents: a doctors and a patient collaborating to advance the art and science of diabetes care at the ADA Scientific Sessions. I think that patients and doctors collaborating is a brilliant model. All the diabetes complexity outlined in the opening paragraph, along with all the associated variability is self-managed the vast majority of the time by patients guided with a small but critical sliver appointments with their health professionals. Somehow in that little white space, doctors and patients figure out jointly how to make the time represented by the blue space successful. All this is a very long way of starting to making a case for asking, "Who knows best what will drive success in the all the blue time on Manny’s chart?" We have seen that disruption to access to testing supplies in an attempt to reduce supply costs, resulted in increased hospitalization, costs, and mortality. Diabetes is complex. It is highly dependent on patient self-care. There are 30 million or so people with diabetes in the US. It is a safe bet we have different approaches to succeeding in the blue space on Manny’s chart. Long-term diabetes costs are contained by what happens in that blue space. The best practice is individualized diabetes care programs. The appropriate device may vary. 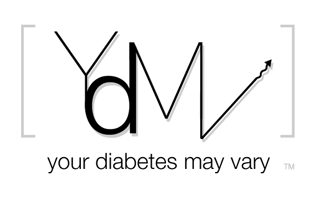 You Diabetes May Vary - So Will Your Care Program and Your Diabetes Stuff. Access matters for long-term success.